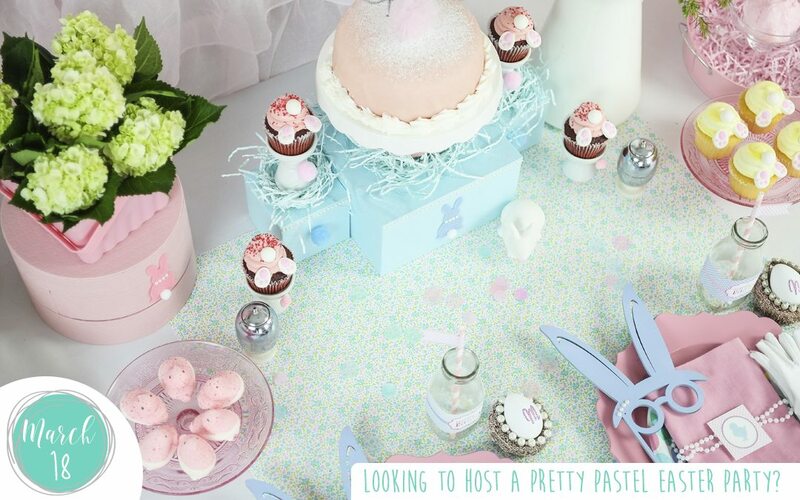 Looking to Host a Pretty Pastel Easter Party? 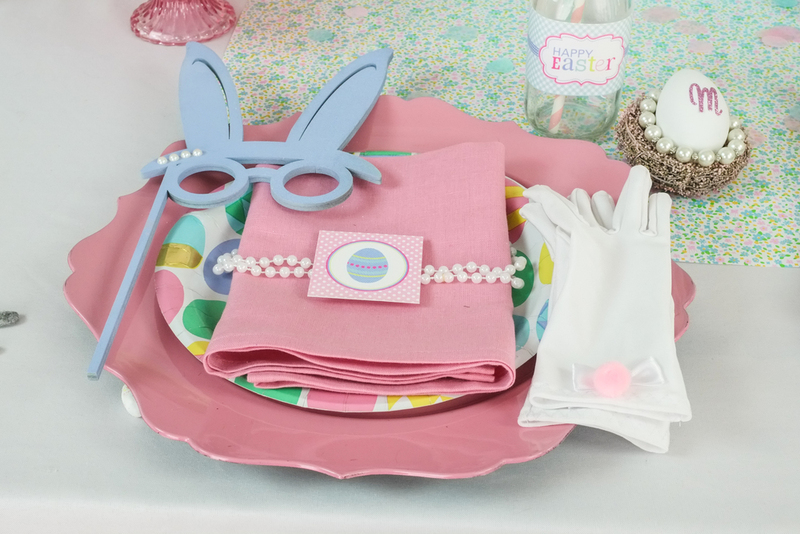 If your looking to host a pretty pastel Easter party, here are some ideas and inspiration to get you started. 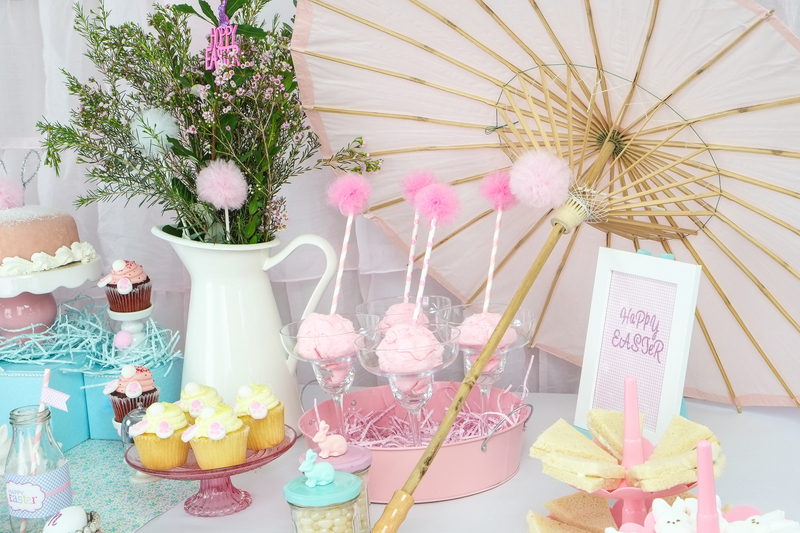 I recently hosted a pink & blue pastel brunch for my daughter and her bestie Riley Grace inspired by old fashion pastels, pearls and furs. Both Parker & Riley Grace are now 4 years old and have played together since they were less than a year old (this was when both families moved to San Francisco independently). Now that Riley Grace and Parker are older and attend pre-school at different locations my friend Sara (Riley Graces mom) and I make sure they still get plenty of time together as well as regular sleep overs. This week we decided to surprise the girls and pick them up early from school one day and host a “little ladies who brunch” for them. 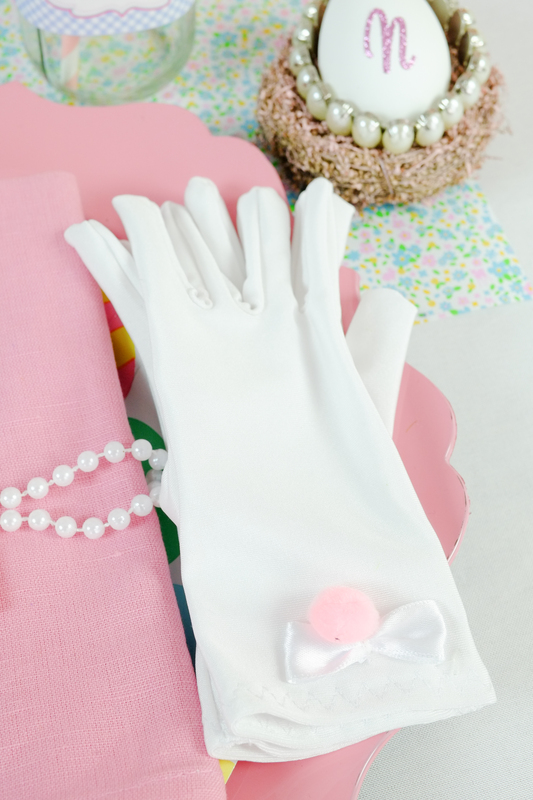 We had both spotted at Target sweet little luncheon gloves with bows and sets of pearls . 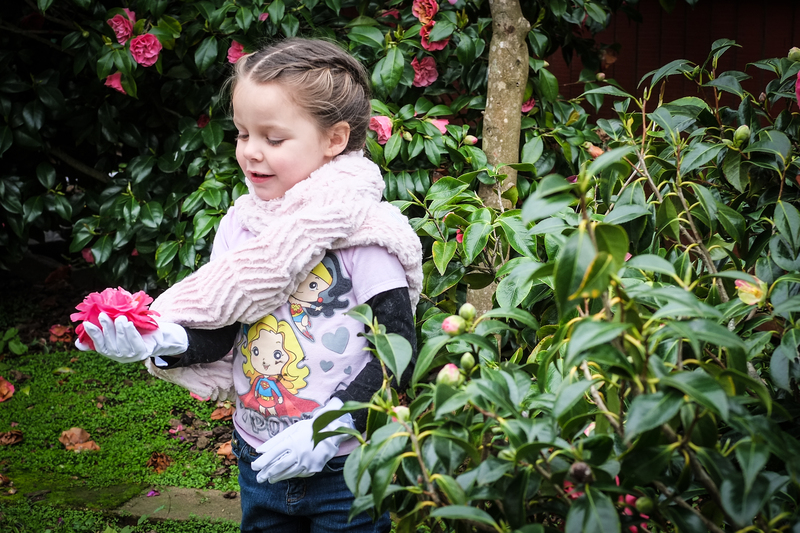 This is where it all began… both girls love playing dress up, everything from superhero, princess, doctor, animal etc. Today it was to be grand old ladies – we even gave them dress up names “Martha & Nancy” lol. 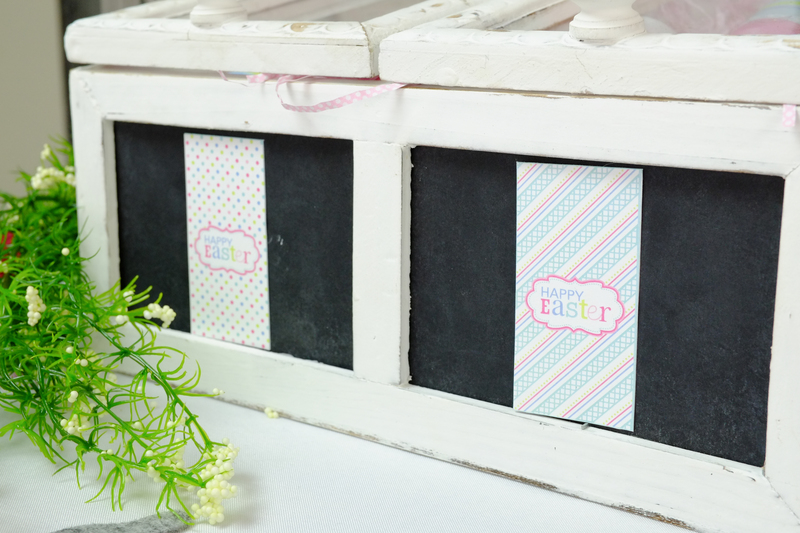 Once we decided on this theme my first stop was party printable graphics. Usually I would start from the invite, but in this instance there wasn’t one so I used the pattern in the graphics as the base colors for the theme. Although we were going for that glam ladies luncheon feel I wanted the modern take on it. 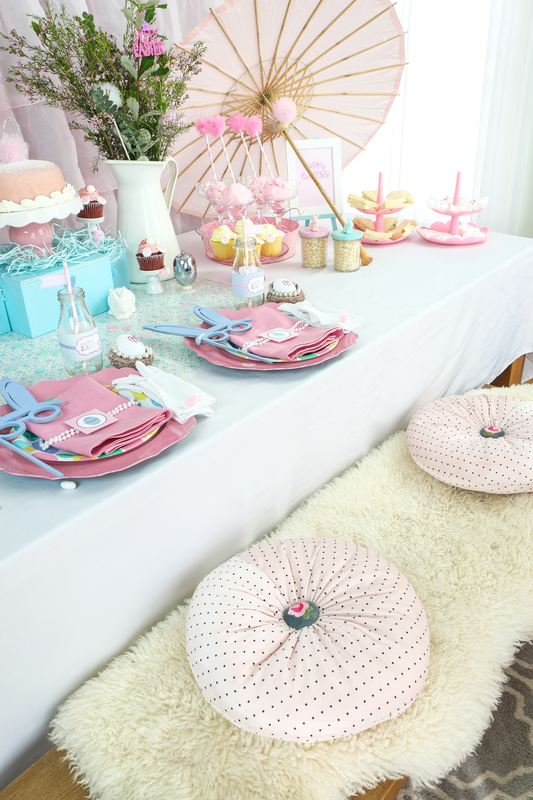 I’ve loved & used Anders Ruff for years, since I found them and used their designs for my son’s bowling party. 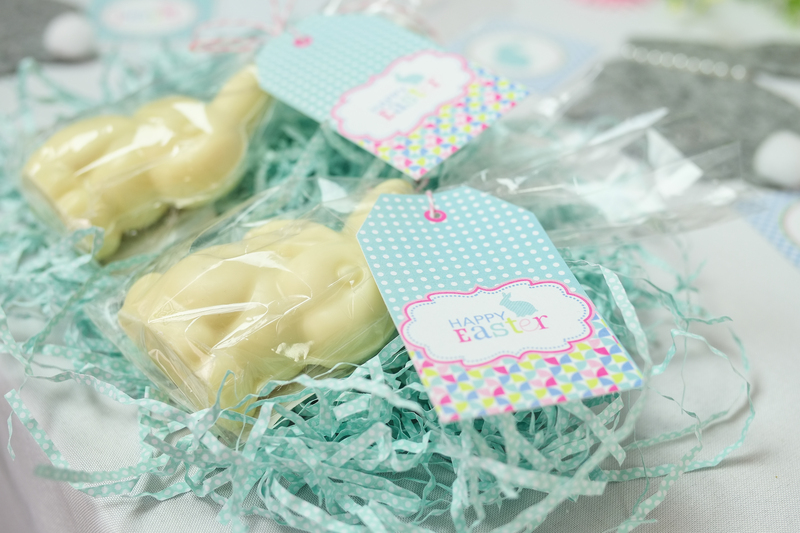 They always have fun, unique graphics and this sweet “Easter has Sprung” is no exception. 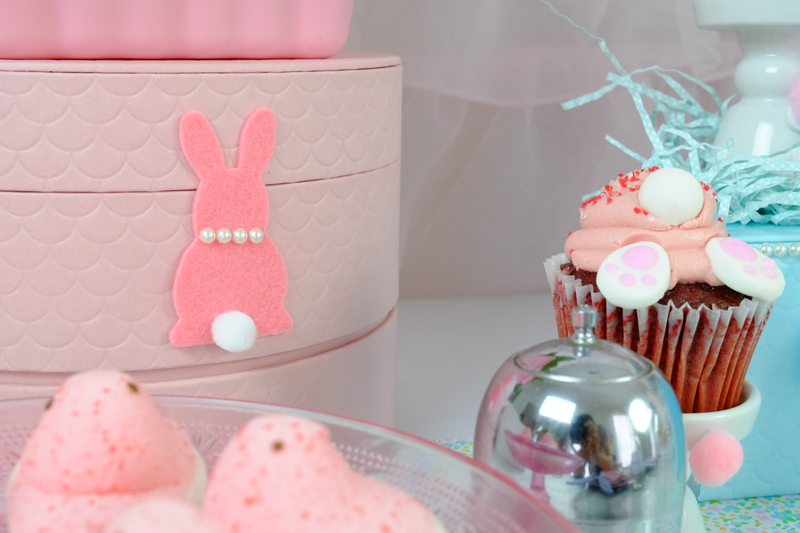 The pastel coloring was perfect, the right colors and a fresh modern design. 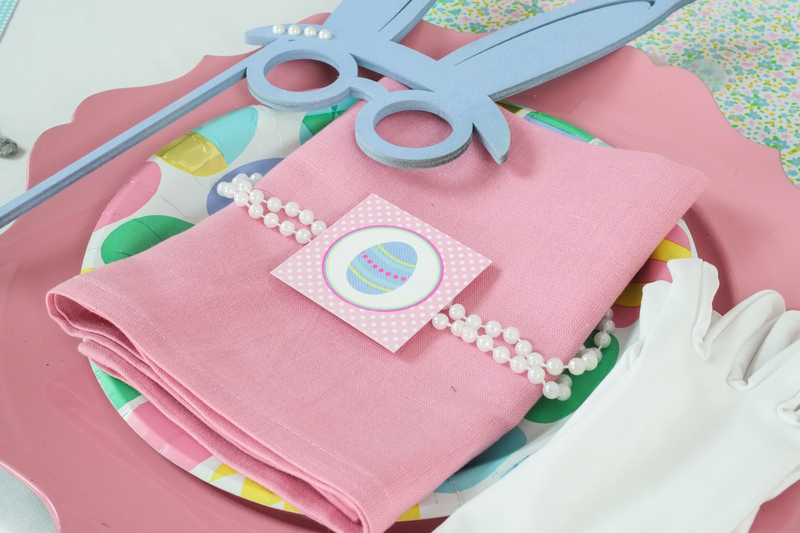 I was drawn to the baby blue & pink, the pink is a gingham and the blue a diagonal design gingham, as well as with polka dots. 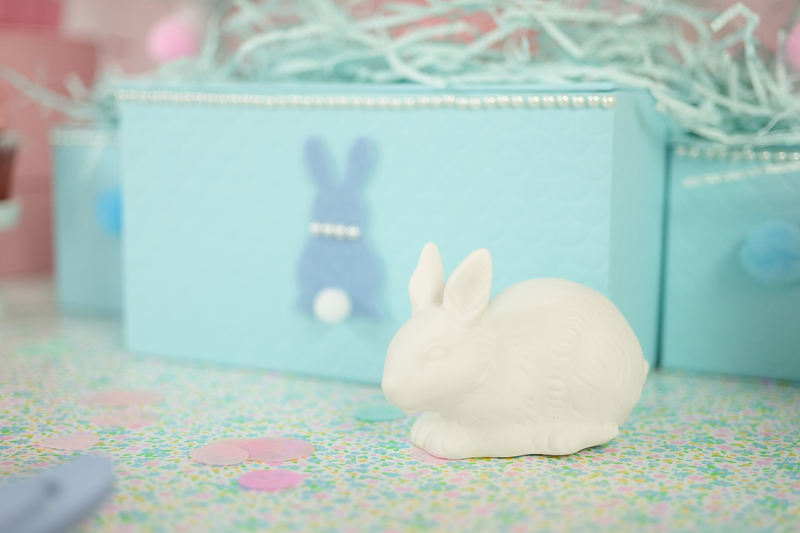 Anders & Ruff have matched each pattern with cute little pastel eggs, bunnies & chicks, perfect Easter elements for the décor. I know the lovely ladies of Anders Ruff through friends so they kindly gave me the set to use but if you like it you can get the entire set quite reasonably for $12.50 and download instantly. Next the matching décor. I’ve been itching to reuse the gorgeous pale pink tulle poms (I used them for Parker’s birthday pink race car party) I got from Fizzy Party. I had also just bought some egg shell blue & pink (dress up or jewelry) boxes on my latest (and definitely not last) run to Ikea. So I thought they would be perfect to use as platforms on the table. I like to raise certain elements on the table (like the cake) to give more depth to the layout. 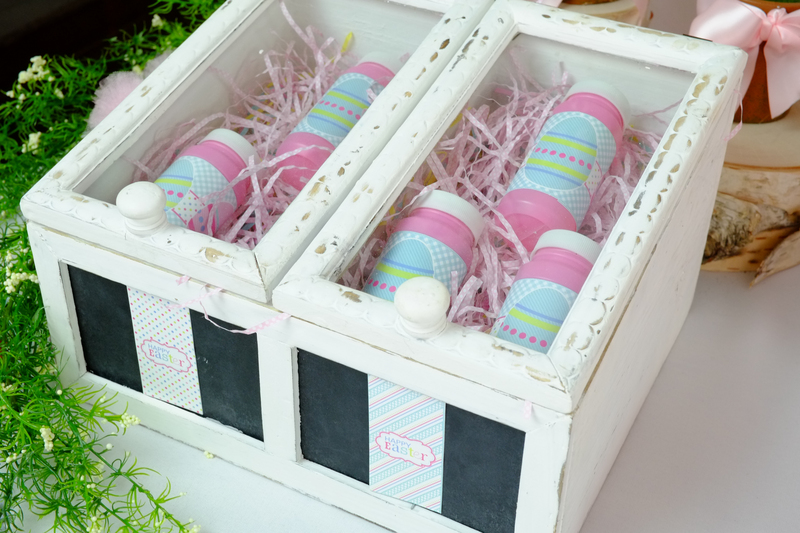 Prior to the party I did a little bit of DIY on the boxes, you can buy stick on strips of pearls at most craft stores like Michaels, I added strips to the boxes and also onto the felt bunnies I had bought. 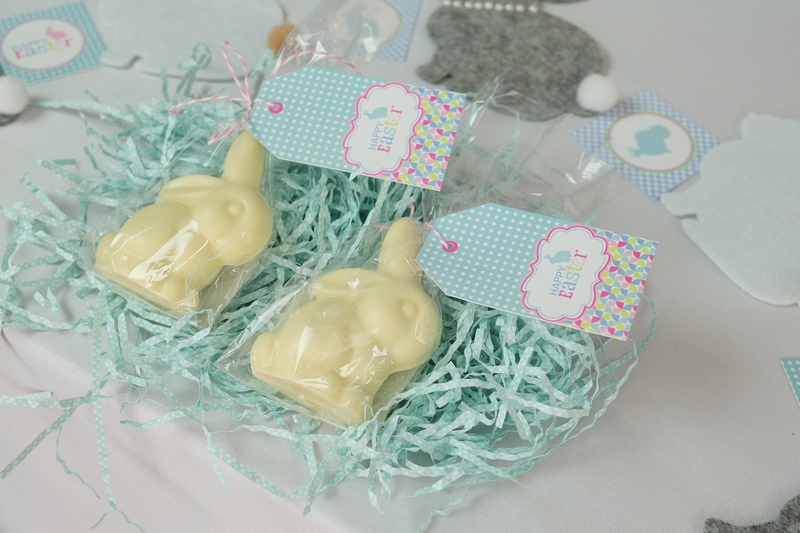 Some of the bunnies were stick on so I also added these to the boxes. Other DIY elements include my favorite, spray painting! 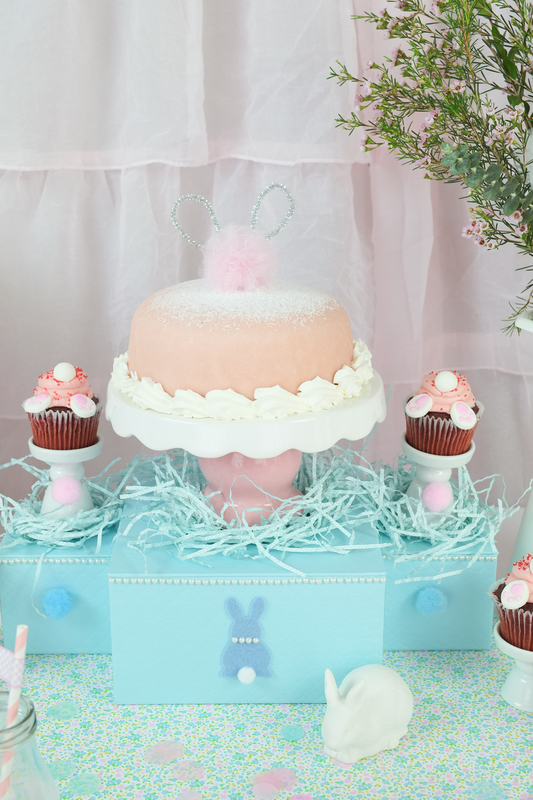 I used spray paint to make the wooden bunny masks baby blue and to turn the little birds’ nests a baby pink. 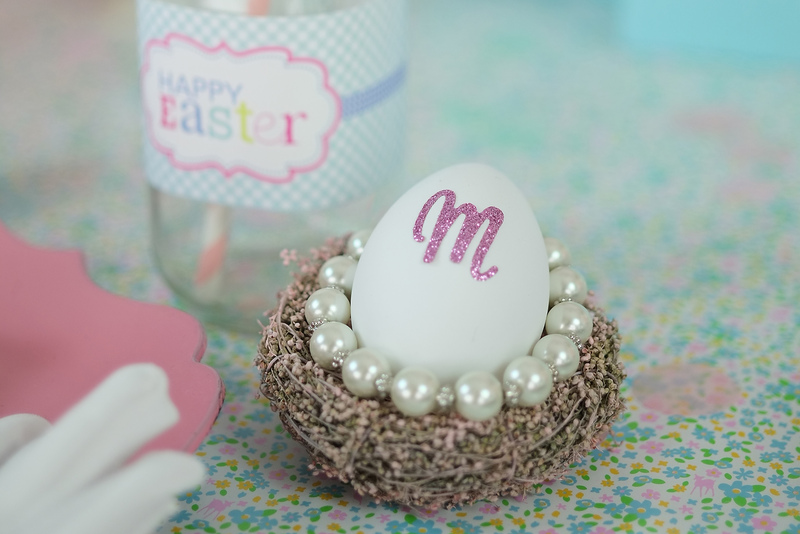 Then more “glam” – stick on pearls for the masks, and pearl bracelets on top of the nests, the egg place names rest atop a little bling. This also kept them sitting up well. I used the paper sheets Anders Ruff provides (plain sheets of the designs) and cut a piece to fit a white frame. 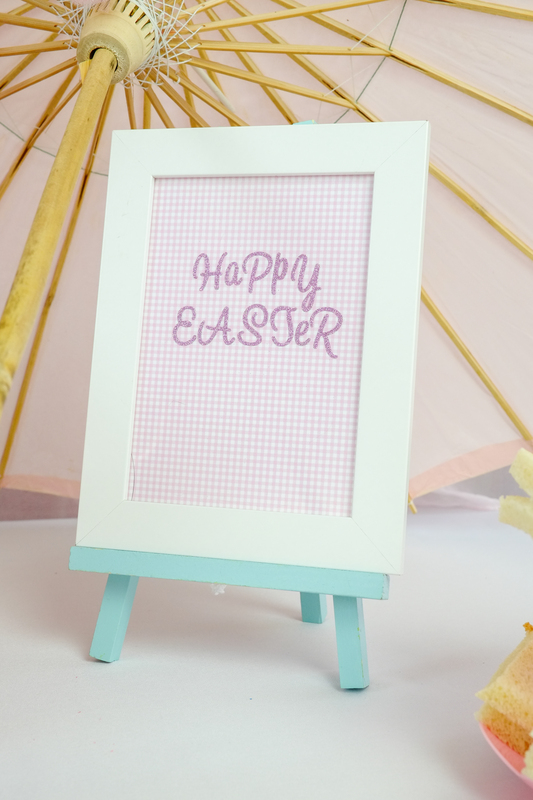 I used stick on pink glitter letters to spell out Happy Easter. 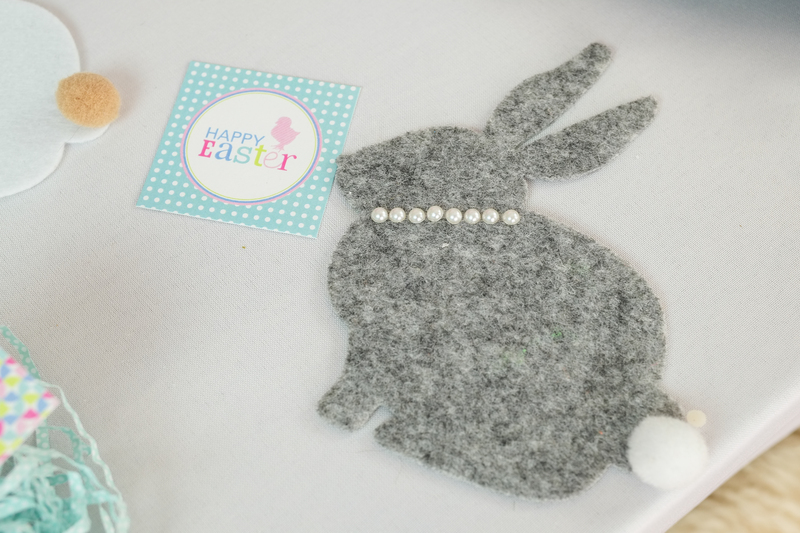 I used these same stickers on the plain white eggs as a simple monogram on the place setting for the girls – very fancy! 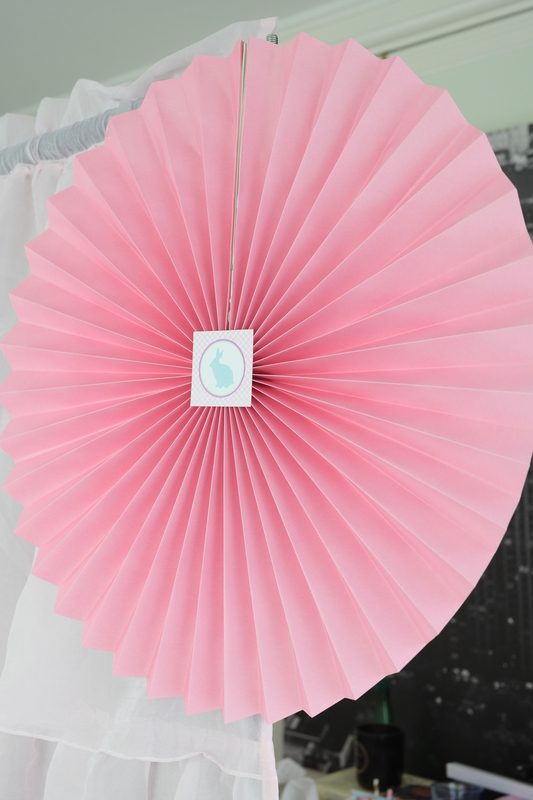 Next I used a large paper umbrella Parker has in her room “to keep the sun off our ladies” and a piece of floral wrapping paper under the cakes as a table runner, this is a really economical option and also means less washing up! plus the kids can draw on it if they are so inclined. 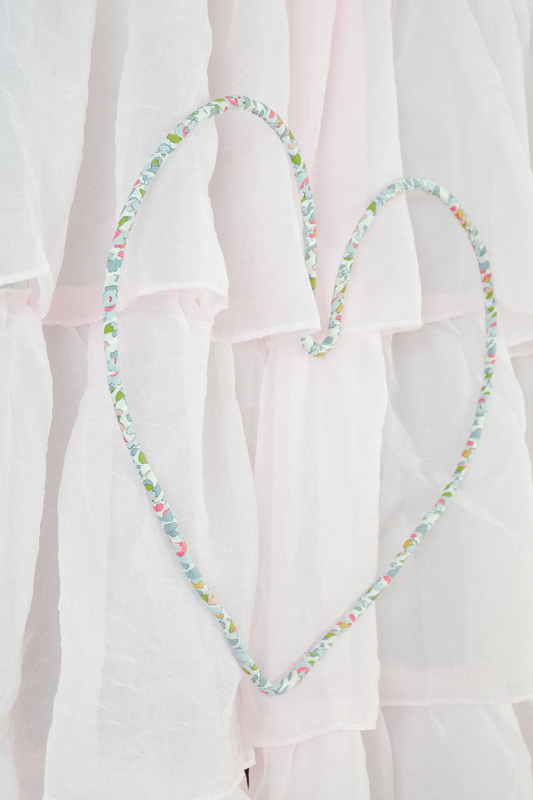 I also spotted the gorgeous liberty pattern heart my friend Anna at TwentyOneFifteen made for Parker’s room and decided this was a nice simple addition to the pink frilled backdrop. I tend to rummage round my house before I set up for every party, I’m a (not so) closet hoarder (check out my prop rentals!) so you never know what I might find to add in. I love fresh flowers for brunch, for this one I chose a gorgeous set of wild looking flowers and used a water jug as a vase, I added a wooden Easter message on a stick & a pom for decoration. 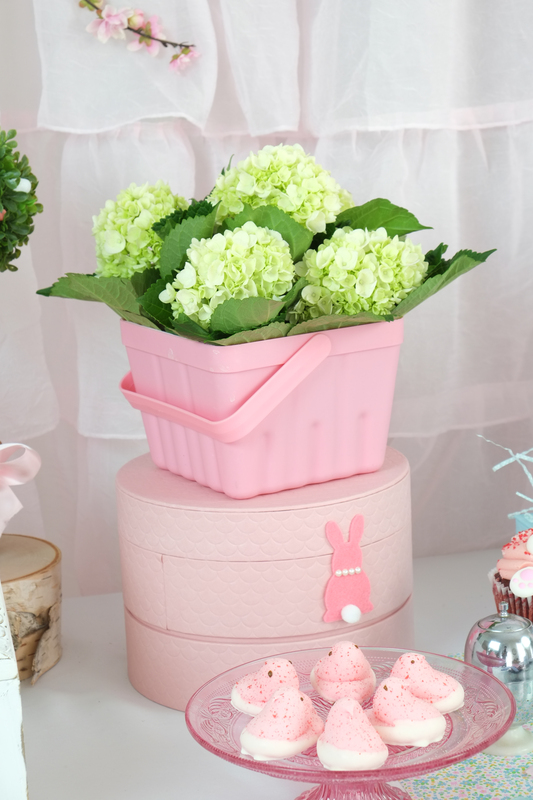 Then some added simple hydrangeas in a pink Easter berry basket ($3 at Spots corner in Target). 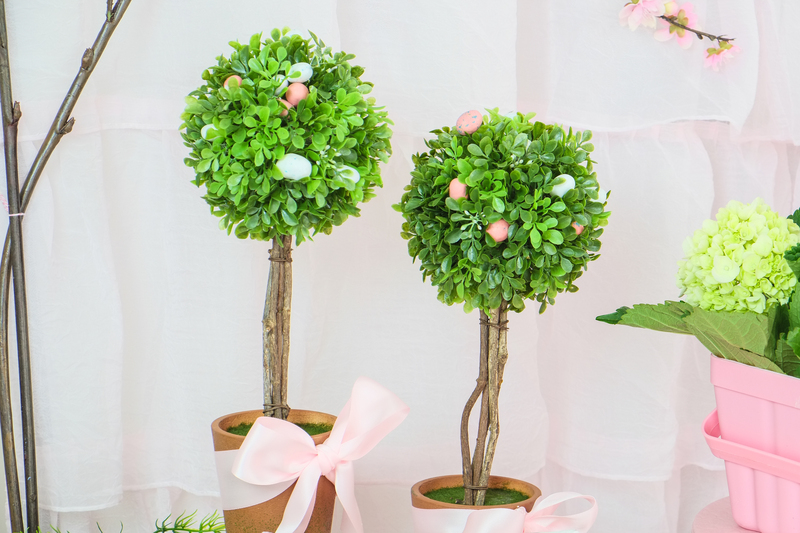 You can have a lot of fun with faux flowers & foliage as well. 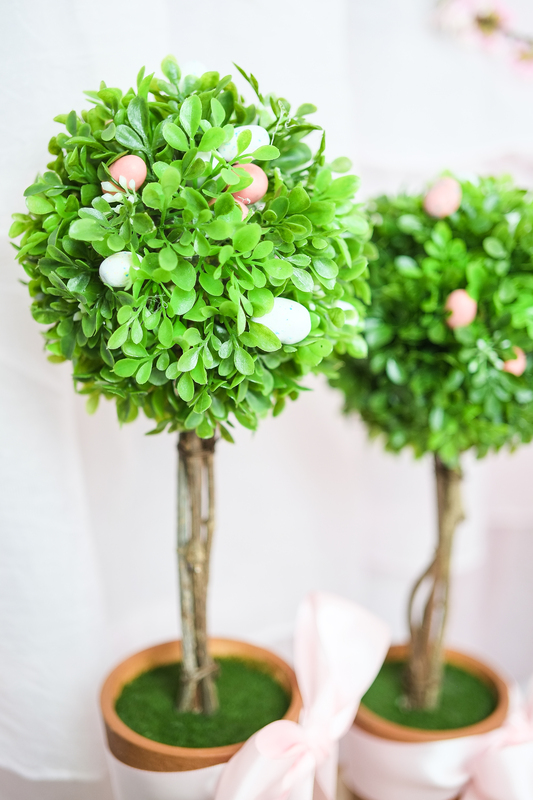 I added some to the table and laced some poms within the stems and for a bit of fun added chocolate eggs to little topiary trees, the girls LOVED these, they almost believed that the chocolate grew on trees! I have a mini hothouse I picked up on sale at Michaels, I thought I was going to fill it with candy initially. I like the little doors that open on top. But in the end that wasn’t working, a bit to big for candy so I made it into an “egg coupe”! The egg coupe housed the “bubble” eggs. 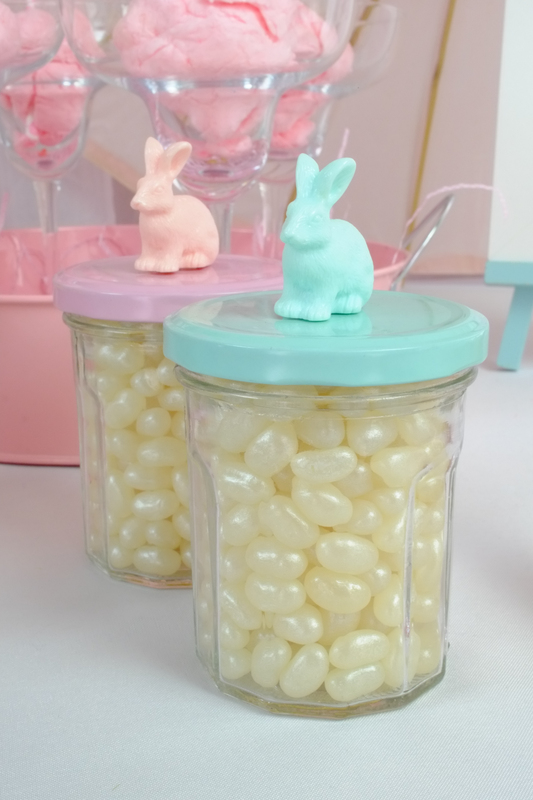 The bubble labels have eggs on the front of them so they made a sweet surprise for the girls when they took a peek at the eggs resting in the grass and something to entertain them outside. Sara, being better at food than I, its that ingrained southern hospitality! 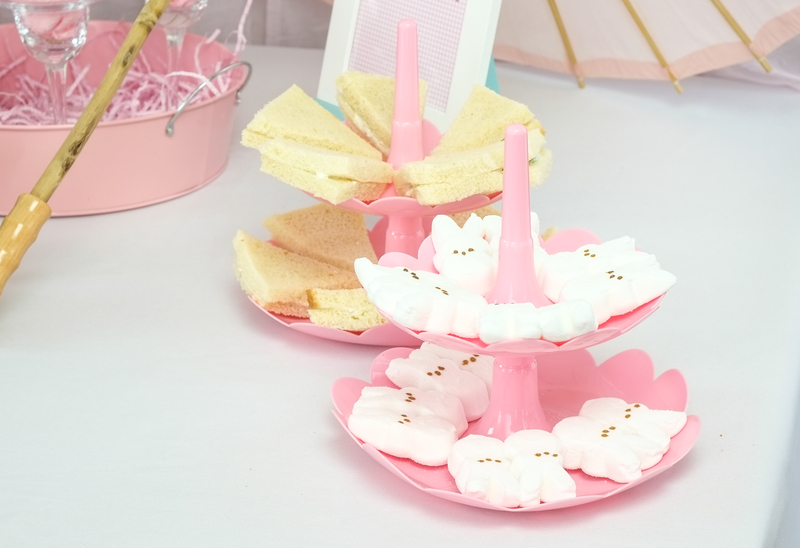 made the cutest little tea sandwiches for the girls, filled jars with jelly belly’s (2 jars for $3 at Target), bought peeps and made yummy cupcake treats (with little bunnies burrowing into them using a decorating set she found at Michael’s) . I really wanted to keep the food simple (the girls would be getting excited and wanting to play dress up) so I didn’t need to add much more than that. It didn’t need to be elaborate just enough to look & feel like “brunch” and be very pretty! 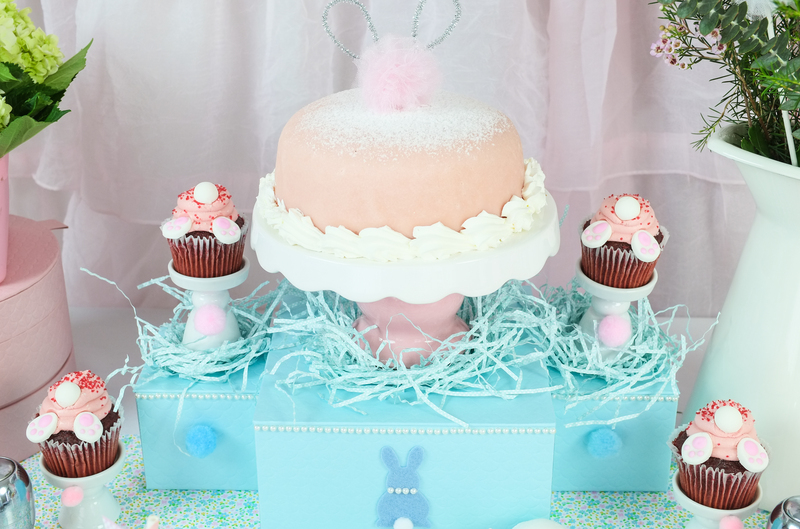 So other than Sara’s food I added a classic pink princess cake from our local supermarket (I made a burrowing bunny on top of the cake too, this one with silver pipe cleaners for ears and one of the poms as a tail) for the adults! 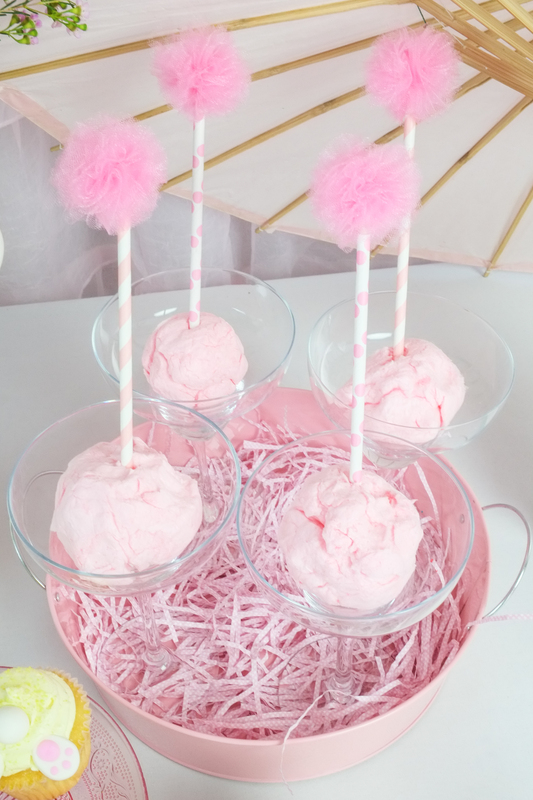 As well as candy floss sticks they could hold (Straws with poms added to balls of candy floss) that I put in martini glasses. As a parent of 2 kids I don’t get to use them much for real martinis these days! 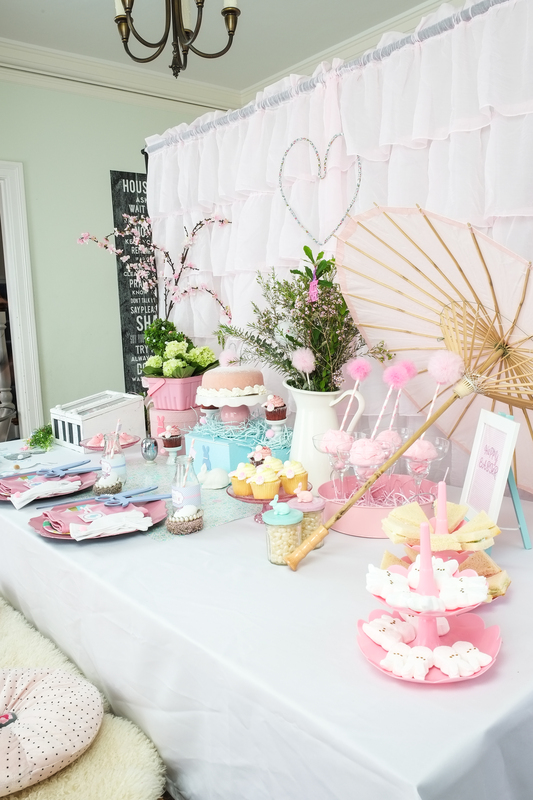 We picked the girls up from school and surprised them with their pretty pink & blue brunch and they loved it! Parker had left in the morning with not a sign of the party and came home to a yummy brunch and cake. Lots of food and excited role play ensued. 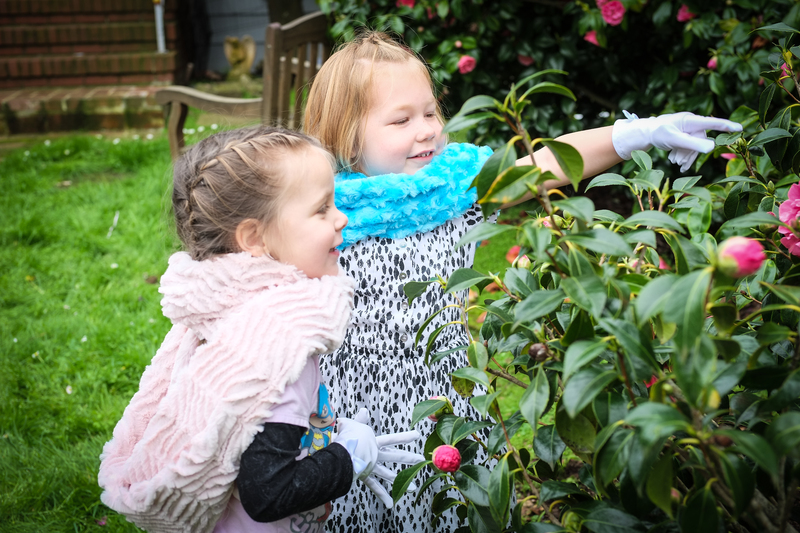 We then took them outside complete with furs and gloves to look at the flowers and wander hand in hand round the garden. What a lovely afternoon tea for “Martha & Nancy”. 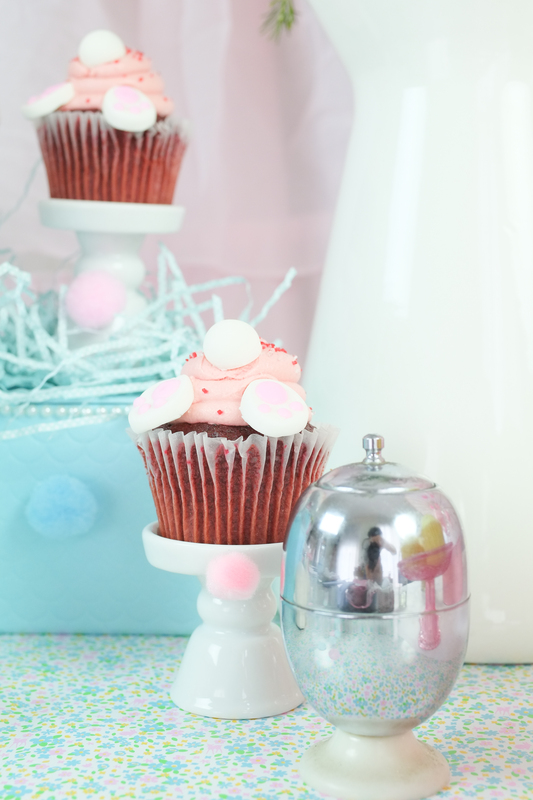 Look out for a fun outdoor party in my next blog post!